If you’re pregnant, or planning to get pregnant in the near future, there are probably a million things on your mind. In addition to all of the planning for your new baby, you may have an extensive financial to-do list, too. It’s no surprise that expecting mothers research life insurance options. In fact, 33% of Americans say starting a family is the reason they buy life insurance at all. But there’s lots of misinformation out there. So, we’re putting an end to the myths about buying life insurance while pregnant. Why Should Pregnant Women Buy Life Insurance? In the world of life insurance, generally the younger and healthier you are, the less expensive your monthly rate will be. If you’re starting a family in your mid-20s and in good health, you can buy a term life insurance policy and lock in a very low monthly rate for the next 10, 20, or even 30 years. Now, we’re not saying those nine months are going to make a world of a difference when it comes to your insurance rates, but let’s be real. Once your little one is born, do you really think you’re going to have the time to even think about buying a policy? Free time in your baby’s first few months is precious — and strictly reserved for bathing, napping, or having a conversation with another adult. Now, let’s discuss these myths. In forum after forum, women write that they’ve been declined for life insurance because they’re pregnant or had some sort of complication related to pregnancy, like gestational diabetes or pre-eclampsia. Every insurance company has their own rate factors and underwriting practices. The big reason why an agent may ask you to wait until after your baby is born is your medical exam. Certain things might show up as “red flags” in your blood work, but they are actually normal for pregnant women. 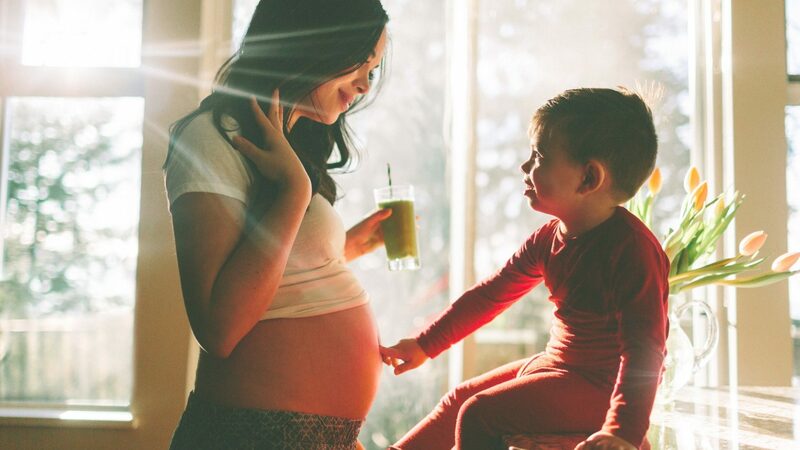 For example, during your second and third trimester, your cholesterol levels are higher because your baby needs it for healthy brain and limb development — a red flag for non-pregnant women, but perfectly fine for mothers to be. Same thing with your blood pressure; it’s lower but that’s expected. And let’s not forget the typical 25-35 pounds of baby weight. In traditional underwriting, these “abnormal” ranges might read as a person who is a higher risk to insure, and ultimately raise your monthly insurance premium. So, there is some truth to that myth. With Bestow, you can buy a term life insurance policy online without a medical exam. Rather than adding one more doctor’s appointment to your schedule, we verify the information you provide in our online questionnaire. We do this by using a combination of data sources (like prescription, financial, and driving history) to underwrite your policy instead. Plus, this approach avoids the shortcomings of traditional BMI categorization. Ask any CrossFitter. Similarly, normal pregnancy weight gain shouldn’t be considered a risk factor. So, if you’re generally healthy, your monthly rate should not increase just because you are pregnant. Life insurance is especially important for women, who are far less likely to have coverage than men. Moms need life insurance, whether you work full time, part time, or stay at home. It’s a way to protect your family and provide financial support. Think of life insurance as a financial gift that can take care of your family for years to come. Life insurance covers more than just funeral costs. It can replace your monthly income and pay off the mortgage and other debts. It can also provide additional support for expenses like childcare, housekeeping, college tuition, and more. But isn’t life stressful without it? Our Coverage Gap survey found that 88% of Americans agreed that long-term financial security was a top priority for themselves and their family, yet 27% felt they’re financially prepared to replace long-term income should they unexpectedly die. Rather than worry about what would happen to your family without your support, think proactively and secure your family’s future now. Spend 5 minutes getting a policy today, and live with confidence for the next 10 or 20 years. That’s one less weight on your shoulders — and more room to focus on the important things in your everyday life. If you’re generally healthy, you can apply for a term life insurance policy online and be covered in minutes. For example, with Bestow, applying for coverage while pregnant is a breeze. We don’t penalize intentional weight gain or loss — like baby weight — in your monthly rate. There’s no physical medical exam required either. Just answer some questions about your lifestyle and health, and get an underwriting decision instantly. Apply for coverage today. Don’t let pregnancy deter you from protecting your family’s financial future. Do the opposite! Apply for a term life insurance policy ahead of time and check that item off your to-do list now — you know, before those 4 a.m. feedings begin.